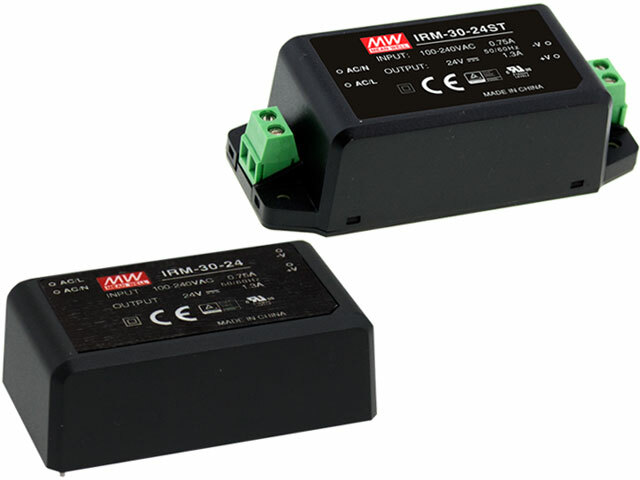 TME’s offer now includes IRM-30 series AC/DC converters from MEAN WELL. Similarly to the series marketed thus far (i.e. IRM-5/10/15/20), this one is also available in a version ready to be soldered onto a PCB. Additionally, MEAN WELL also offers converters with terminal blocks, which enables cable connection. The main advantages of IRM-30 converters are small dimensions and no load power consumption of <0.1W. Thanks to that, it is possible to noticeably decrease application sizes, and follow strict standards regarding power consumption. IRM-30 converters are meant to work in harsh conditions. Their working temperature extends from -30°C to +70°C, and tight enclosure protects the electronic components against dust and moisture. The enclosure is made of a flame retardant material compliant with the UL94V-0 standard. Yet another benefit is that the converters meet the anti-vibration demand up to 5G. IRM-30 series converters operate within input voltage range from 85 to 264 VAC, whereas output voltage depends on a particular model, and can be 5, 12, 15, 24, or 48 VDC. Furthermore, the converters are protected against short circuit, overload, and over voltage.